For those who aren’t familiar with the Don Pepin branding, No, my father did not smoke this cigar. In fact, he was a non-filter Camel smoking man for 60 years. He did not die of cancer. Go figure. Anyhow! This is a cigar that has been in my humidor since the last great smoke out in NY held by Cigar Aficionado. It was one of the many given out to those who attended and tonight was its lucky night. I should say that tonight was MY lucky night. I had previously smoked a Gurkha regent while cooking tonight and after smoking a few of those have become familiar with them and do enjoy them. I’m not so sure if I will reorder but would not hesitate if I found a deal. The La Reloba, however, has just hit my MUST GO BUY list. Since I didn’t actually pay for this cigar I was unsure if it was a $7 to $8 cigar. To my surprise this beauty is made for the $5 to $6 dollar range (depending on your local taxes of course!). To me this is everything a staple, mild/medium cigar should be. Smooth draw, great burn and good flavor. I even loved the way the ash burnt perfectly throughout and when the ash dropped off it showed off by sticking the landing straight up (see the picture). There is also a version of this with a habano wrapper. This has the potential to be the favorite t-shirt kind of cigar. No need to fret, just pull it out and smoke it, regardless of the occasion. I’ve had a few cigars the past day or so that peppered my tongue relentlessly and this was a great departure from that. I enjoyed it was a glass of The Dalmore’s Gran Reserva, which was made by Richard Paterson as a complement to cigar smokers, and I am beginning to believe I am not going to find a cigar that does not go well with this dram. 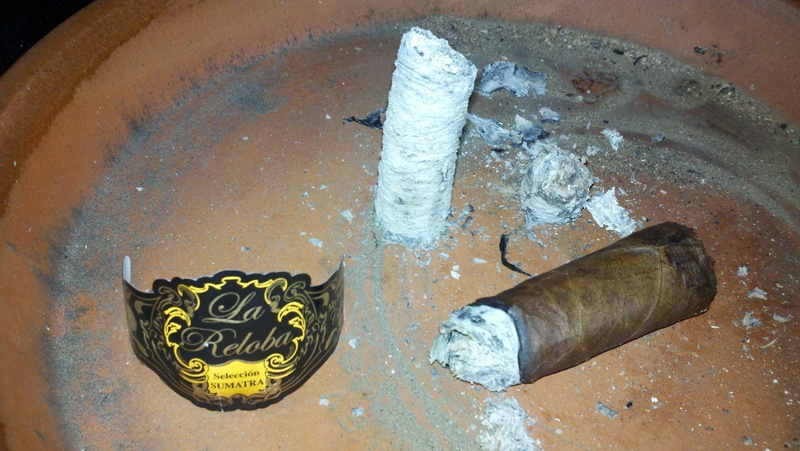 Well enjoy, buy yourself some La Reloba Sumatra’s, some Dalmore Gran Reserva and have yourself a wonderful time.